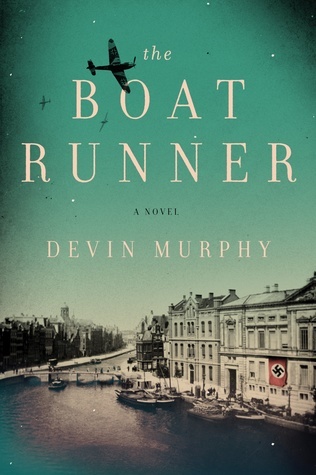 I read a lot of books about WWII and The Boat Runner was a different look at the war than I've read before. Devin Murphy did a fantastic job of creating a main character who drew the reader into the book from page one until the last page. It was more than just your normal coming of age story - it was a coming of age story during a time that the wrong decision could have caused your death or that of someone close to you. At the beginning of The Boat Runner, Jacob is 14 and living in a small Dutch town with his parents and his older brother. Due to the father's business, the family lives quite well and the boys are planning on a fun summer during 1939. Their lives are soon to be drastically changed when the Germans invade their town, set up camp and take over the town. After their father sends the two boys to Hitler youth Camp in Germany, Jacob is unsure of his loyalties even after the invasion. He doesn't know who he should hate - the Nazis who took over his country and his father's business or the English pilots who bombed his town and destroyed so much more. His loyalties are tested over and over throughout the next four years until he is faced with a life-altering decision and has to fight to stay alive. This is a beautiful well-written novel about a terrible time in the history of the world. Even though the story is told about one family in one part of the world, it represents the stories of millions of people in Europe throughout this time period. This book is so well written and exciting that it's hard to believe that it's Devin Murphy's first novel. I can't wait to read this future books! Devin Murphy grew up near Buffalo, NY in a family with Dutch roots. He holds a BA/MA from St. Bonaventure University, an MFA from Colorado State University, a Ph.D. from the University of Nebraska—Lincoln, and is an Assistant Professor of Creative Writing at Bradley University. He has worked various jobs in national parks around the country and once had a three-year stint at sea that led him to over fifty countries on all seven continents. His fiction has appeared in over 40 literary journals and anthologies, including The Missouri Review, Glimmer Train, The Chicago Tribune, New Stories from the Midwest, and Confrontation. He lives with his wife and children in Chicago.